Although she was the pious daughter of pious parents, the young Teresa was also drawn to romantic tales of knightly adventure, the pleasures of spending time with her friends, and caring for her appearance. But after the death of her mother, when Teresa was fifteen, and then of her eldest sister, she was sent to an Augustinian convent. She spent eighteen months there, but as a result of an illness, she returned home. She eventually decided to return to a religious life--as the safest kind of life--and joined the Carmelite Convent of the Incarnation in Ávila on 2 November 1535. I saw in [an angel's] hand a long spear of gold, and at the point there seemed to be a little fire. He appeared to me to be thrusting it at times into my heart, and to pierce my very entrails; when he drew it out, he seemed to draw them out also, and to leave me all on fire with a great love of God. The pain was so great, that it made me moan; and yet so surpassing was the sweetness of this excessive pain, that I could not wish to be rid of it. Like many of the religious women we've encountered this year, Teresa found life in the convent not rigorous enough. In addition to her role as a visionary, she became a reformer, founding a new, more rigorous Carmelite rule, one focused on absolute poverty, self-flagellation, and rigid asceticism. The Discalced (or shoeless) Carmelite Nuns of the Primitive Rule of St. Joseph was founded in Ávila in 1562. Then the visionary and reformer became a builder: traveling throughout Spain, she established convents in Medina del Campo (1567), Malagon and Valladolid (1568), Toledo and Pastrana (1569), Salamanca (1570), Alba de Tormes (1571), Segovia (1574), Veas and Seville (1575), and Caravaca (1576). She describes this frenetic activity--as well as the opposition she encountered everywhere--in her Book of Foundations. In addition to her autobiography, El Libro de su vida (Life Written by Herself), completed before 1567, Teresa wrote a series of works for the women who wished to live a religious life. El camino de perfección (The Way of Perfection), written about 1566, was intended to show her readers the way to achieve their spiritual goals. Her most well-known work, El castillo interior or Las moradas (The Interior Castle or The Mansions) was probably completed between 1577 and 1580--in this work, she instructs her readers in contemplative prayer, leading them through stages of an interior exploration. Libro de las Fundaciones (The Book of Foundations), begun in 1573 and completed in 1582, was written as a history of the order and of its growing number of established institutions. She also composed poems and prayers. More than 400 letters, whole and fragmentary, survive. Teresa died at the age of sixty-seven on 4 October 1582 in Salamanca. You can access all of her works online--you might start with what's available at the Christian Classics Ethereal Library by clicking here. 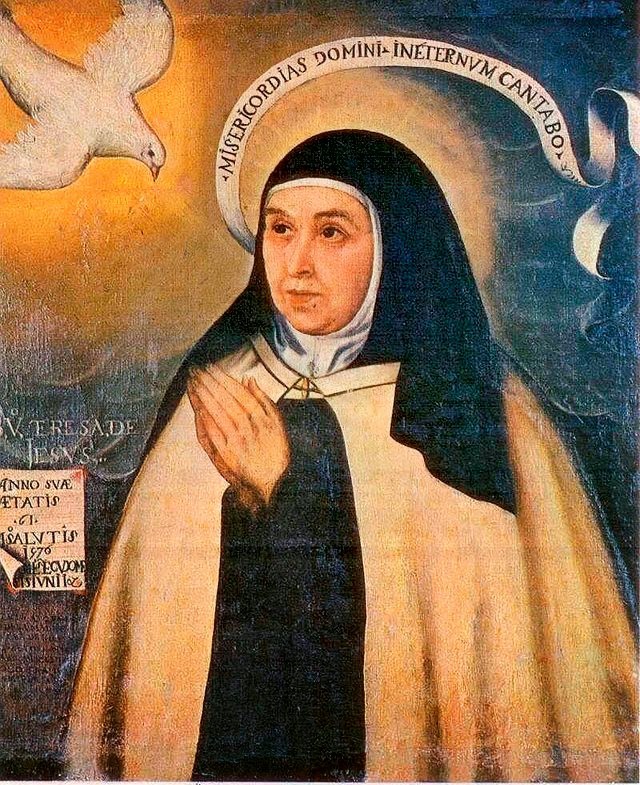 While Teresa does tell the story of her own life in her autobiography, for a good scholarly introduction to the woman and her work, neither a hagiographical view or a romanticized one, I recommend Cathleen Medwick's Teresa of Avila: The Progress of a Soul. *She was recognized along with Catherine of Siena, the two becoming the first two women to be named as Doctors of the Church. Thérèse of Lisieux, recognized in 1997, and Hildegard of Bingen, in 2012, are the only two other women so identified.